These amazing Keto Crepes are from the new Ketodiet cookbook written by my friend Martina Slajerova. 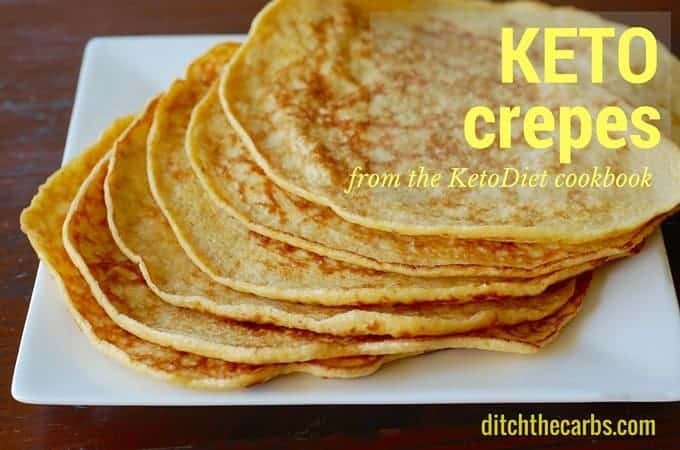 I have tried many crepes and wraps but these keto crepes are incredibly simple to make and incredibly versatile, as are all the 150 recipes in Ketodiet cookbook. 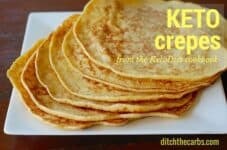 Keto crepes are a fabulous alternative to high carb tortillas or wraps. They can be eaten hot or cold, and can be made savoury or sweet. 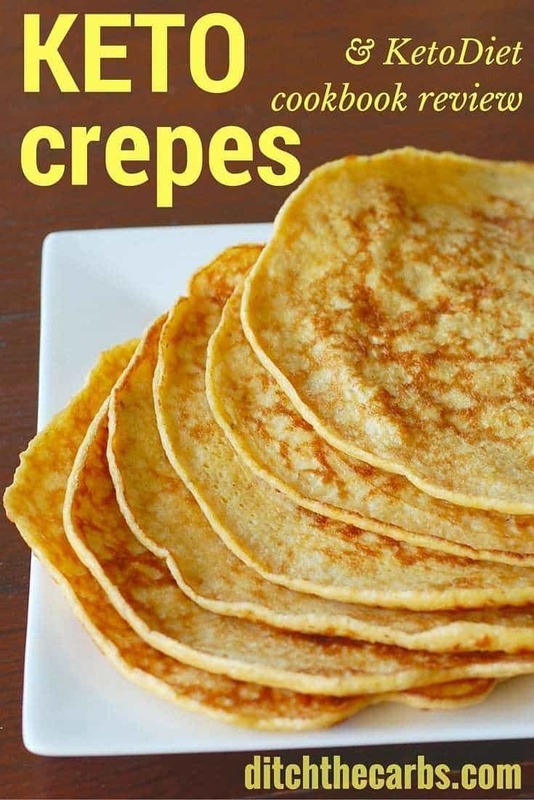 Keto crepes is incredibly versatile recipe. You may already be using Martina’s KetoDiet App or visited her blog. 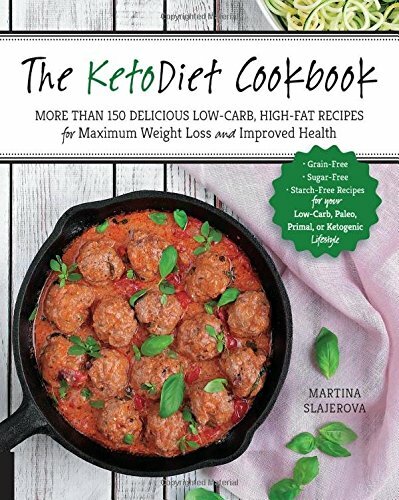 Her new KetoDiet cookbook is a wonderful addition to her phenomenal range of resources and tools that help with the low carb/keto lifestyle. When Martina sent me an early copy of her cookbook, I was immediately impressed. I am giving away one copy of the ketodiet cookbook to one lucky reader. Just scroll down and enter the giveaway below the recipe. The information and guidance it contains is incredible. The Ketodiet cookbook has 9 chapters and 150 recipes which are all low carb, sugar and grain free. It explains how the keto diet works, what basics you need in your pantry then continues to showcase her incredible recipes for breakfast, lunch, snacks, and even healthy lunch ideas. Drinks and desserts? Yes they’re in there too. Martina has always been a fabulous source of information, well researched articles and helpful meal plans. I thoroughly recommend this book for your low carb kitchen, and even one for a friend. It will guide you through the low carb and ketogenic diet with ease. Click here to buy now. I decided to showcase one of Martina’s recipes that I thought would be the most versatile and useful for a family. Wraps are such a staple for so many lunches, so these keto crepes are a lovely alternative. They are sturdy yet soft and delicate. Use them as a tortilla wrap with chilli, cheese and sour cream, or how about adapting the recipe to a sweet version and making chocolate crepes using my sugar free chocolate spread? Keto crepes can be made sweet or savoury. Imagine these with sugar-free chocolate spread over them? Ah-mazing!!! Or add cheese, ham and avocado for lunch. Separate the egg whites and from the egg yolks. You will only need 2 egg yolks and 8 egg whites, as the crepes hold better together when more egg whites are used. Reserve the remaining egg yolks for another recipe. Place the whole eggs and egg whites, coconut flour, psyllium husk or chia seeds, coconut milk, baking soda and cream of tartar in a bowl and mix well. Add the garlic powder (or sweetener if making sweet keto crepes) and whisk well. Allow the batter to sit for 5-10 minutes so the coconut flour and psyllium have time to swell and absorb the moisture. Whisk again. Heat a nonstick pan evenly with the ghee or coconut oil. Move the pan while pouring in the batter to ensure the batter covers the bottom of the pan in a thin layer. The batter should be runny so it will spread easily. If it is too thick, you may add 1 tablespoon of water to the mixture. Make the crepes one by one, greasing the pan in between to ensure the keto crepes don't stick. Depending on the size, you can make 2 large or 4 medium crepes per serving. Once cool, store in an airtight container in the fridge for up to 5 days. Amazing wonderful recipes! Ingenious replacement with Keto friendly ingredients! Would love to win the free cookbook!! I just made these. The garlic is too strong for me so I’m going to try them without. I also had trouble getting them thin enough. Next time I’ll thin the batter, cook them longer on lower heat. Can I use cow’s milk for the coconut milk? That may work, but coconut milk is much higher in fat, generally about 25%. Wondering if oat fiber could work instead of psyllium? can i substitute the psyllium husk with xantham gum? or anything else. Having a difficult time finding psyllium husk. I finally found it in my grocery store pharmacy by the laxatives! It’s the same thing as Metamucil, just make sure it’s plain, not orange flavored. Ok I made these last night. And they taste good, but they taste more like a fancy fried egg. I used ground chia seeds and half & half for the “milk” product. I do like them though, I’m going to try them again but with the actual psyllium husk powder and see if they turn out more tortilla like. If you’re going sweet on them like I did,you can make homemade whipped cream w/your favorite powdered sweetener and a dash of cinnamon, they enhance the flavor! Dab it with just an 1/8 of tsp of Polaner All Fruit and you just entered keto Crepe heaven! Is the taste of coconut supposed to come through with these? Mine tasted a bit coconut-ty which is fine for me if served as a crepe, but I was using them for your low carb burritos and the coconut flavour didn’t go so well with the flavours of the mince mixture. There might be mild coconut taste, but the spiced mince/ground beef would overpower it for burritos. Add plenty of cheese, salsa and avocado for a real tasty meal. I made them last night, I don’t taste coconut at all, they just taste like an egg to me. 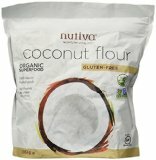 Any chance I can make it with almond flour without it causing issues? I’m not sure about that. It may not hold together as well. If you do try, please come back and let us know how it works out. I love hearing how readers adapt my recipes. I used 4 eggs, some 18% cream and a handful of almond flour in olive oil. Held together great. Tasted like eggs and didn’t have a lot of flavour. Could work with some tweaking. Hello! Perhaps I missed this somewhere, but how many does this make? Or how many grams is one serving? These look wonderful – but any ideas as to what to do with the 6 spare yolks? That’s a lot of egg to throw away. I’d love some inspiration! Easy peasy, lemon curd!!!! I love this stuff and it is simply amazing. Keto chocolate ice cream from my keto kitchen. You can also buy cartons of just egg whites so you don’t have to find immediate use for extra yolks. However, yolks can also be frozen, blended with a bit of either sweetener or salt, depending whether you plan to use them in a sweet or savoury dish later. Hello. Just to check, 5.5g carb = net or total? All my carb values are total. Is one large or two small pancakes one serving or is it 2 large/4 small? Could I substitute coconut oil for a regular oil? Or ghee for butter? What is ghee? Ghee is clarified butter and is pretty much interchangeable with regular butter. You could use coconut oil, you may just want some extra flavouring or salt as coconut oil is such a tasteless and neutral fat. I’m confused by the egg instructions: you say, separate 8whites/2 yolks, but in #2 you say to place “the whole eggs” and the egg whites, but there are no whole eggs listed in the ingredients, only separated yolks and whites. Can you clarify? I really want to try this. Sounds perfect. Thanks! My reading of this is that because you’re not doing anything separately to the egg whites (like whisking them until fluffy) and it is all being mixed together, you don’t need to separate the two whole eggs, just the six eggs from which you only need the whites. Another way to list the ingredients would be 2 whole eggs and 6 egg whites, rather than 2 yolks and 8 whites. You could look at my keto waffles which are nut free. They can be made in a waffle maker, frying pan or even a panini press. They contain coconut flour if you can tolerate coconut (which is a drupe not a nut). That may be a good option for you? Can they be frozen, if separated by wax paper? I’m sure that would work well, as long as it is in an airtight container. I made these last night for dinner and they were ANAZING! I don’t need flour tortillas in my life anymore! These were so yummy and so easy to make! I’ll be making these ALL the time now! Hi, do you think I could use powdered egg whites in place of fresh egg whites? In the ingredients list it says 2 eggs and 6 egg whites but in the instructions it says 8??? The recipe implies that you use 8 egg whites (6 whites as per recipe plus the 2 egg whites from the whole eggs). I have now written it to state 8 egg whites and 2 egg yolks. I hope that is clearer. Living in France, I’d love to try this but cream of tartar is super hard to find. What could it be replaced with ? You could try replacing the baking soda AND the cream of tartar with 1 tsp baking powder. I bought this book- cannot recommend it highly enough! I just noticed the Amazon links and how they coincide with your recipes! Too cool!